Nissan Juke Nismo Dark Knight Rises. 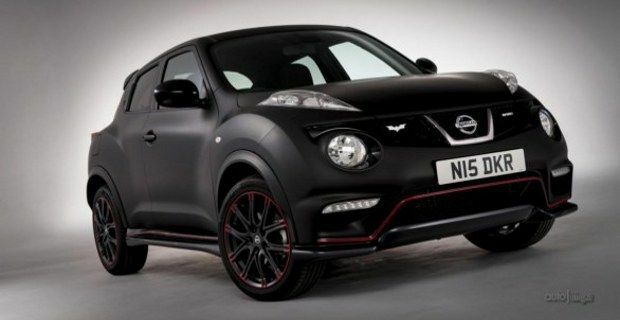 Nissan presents Batman-inspired Juke Nismo, Dark Knight Rises. Nissan has worked in partnership with Warner Bros to create a one-off Batman-themed Juke Nismo special edition called Dark Knight Rises. The compact crossover has been entirely developed and assembled at Nissan's European Design Centre and take its inspiration from Christopher Nolan's movie The Dark Knight Rises, the latest of the Batman's trilogy. The car is based on the Nissan Juke Nismo (Nissan Motorsport), high-performance version of the standard crossover, which features a new aerodynamic kit to improve efficiency and increase power. The core of the Nismo is the sports four-cylinder 1.6-litre turbocharged petrol engine with direct injection that produces a maximum output of 200 hp at 6,000 rpm / min and 250 Nm. The Dark Knight Rises Nismo is available with a 2WD gearbox, an advanced manual transmission that enables the driver setting up to seven speeds. In terms of performance this version can accelerate from 0 to 100 Km/h in just 7.8 seconds, reaching a top speed of 215 Km/h. The thrilling edition comes with a matte black paint job, the same finish of the latest version of the Batmobile featuring in the third adventure of the Dark Knight. There are some red details on the front bumper, across the mini skirts and on the wheel to enhance the sportiness of the car, plus a few Batman-logos scattered on the external body and inside the passenger compartment to add to this unique trim. One of the most amazing special feature of the Dark Knight Rises Nismo are the puddle lights that project the Bat logo on the road, just below the external door mirrors, and also inside, through a game of lights, on the headrests. Batman's fans would go absolutely crazy for this gadget, as it replicates the Bat-Signal, a method of summoning the hero in case of danger, as seen in the saga. As mentioned before, Nissan Juke Nismo's aerodynamic kit highlights the sportiness of the car inside and outside, and emphasise its aggressive look, thanks to the sports suspension and large 18-inch wheels characterised by a red border that recalls the red detailing of the body. To complete the package there's a shark fin-shaped radio antenna placed on the roof of the car. Inside the vehicle is enriched with black suede upholstery with embroidered Batman logos on the headrests and more on the dashboard and the sill. Check out the full Nissan Juke Nismo Dark Knight Rises photo gallery.